Training is available for parents, siblings, caregivers and relatives. It has become obvious for many families that living with a person on the autism spectrum does not mean that the family members always “get” and understand autism. Knowing how persons on the spectrum “see and interpret” life can be very challenging. The family members need to become lifelong “teachers”. There are very specific interventions and visual strategies that work effectively for persons of all ages with ASD. 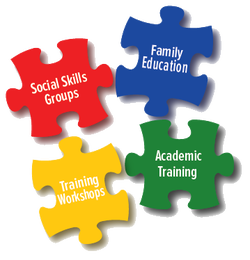 Individualized Education and TRAINING of YOUR STAFF/CAREGIVERS in ASD? We will tailor the session(s) to meet your specific needs! Inquiries for these individualized training sessions should include specific topics of interest, location, technology (if any) available for us to use, and the number of participants.